Turnitin – an online assignment submission tool fully integrated into Blackboard. Feedback Studio – a text matching and feedback tool to assist plagiarism and collusion checks; apply grades and feedback (including audio) onto scripts online. Check against world wide web resources, a central database of student papers, and a selection of academic databases. A clean and simple interface for both staff and students. A suite of expanding e-submission, grading, and e-feedback tools. The potential of an innovative teaching tool. Intuitive drag and drop feedback directly onto scripts. Add audio feedback onto scripts. Comprehensive statistical analysis of assignments, cohorts and scripts. 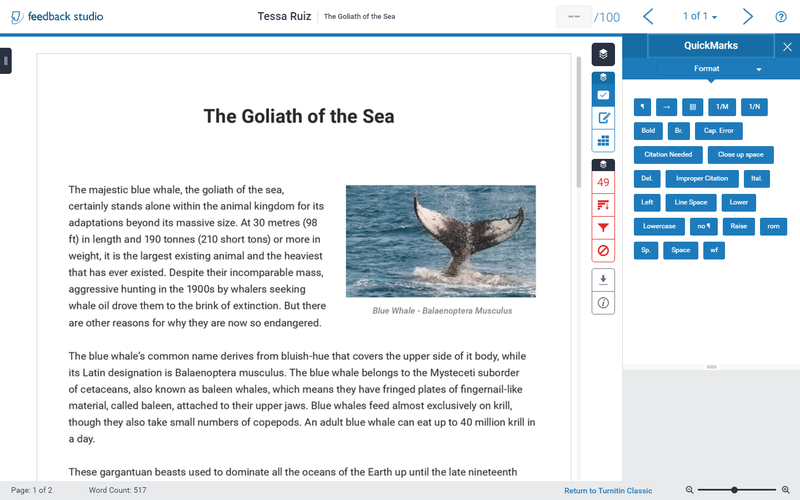 How do I use Turnitin? The first step is to create an assignment in Blackboard. Once the due date has passed, use the Submission Inbox in Blackboard to manage submissions, late submissions and non submissions. Release grades to students via the Blackboard Grade Centre. IMPORTANT The integration with Blackboard means that you need to be aware of specific operational procedures if using the tool for e-submission and/or feedback. A working knowledge of the GradeCentre in Blackboard is also necessary to understand how the integration operates.